OK I’m not a huge fan of court TV shows, but there’s some worth watching. 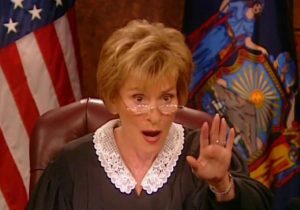 Judge Judy is probably the best of the lot with her feisty no nonsense attitude; even though I’ve been told her audience is fake, and is prompted to behave in a particular way to the camera. Next in line would be Judge Mathis, the comic relief judge, who takes a very different approach to mediation than Judge Judy. And last, but certainly not least, would be Judge Milian of the People’s Court; but I still prefer the original Judge Wapner. The rest I have caught on occasion and I have to say I was not impressed at all. Bad copies of the 3 judges above. And only worth watching if it is the only station you can get reception with, and you have nothing else to do with your life. And I can tolerate the fake paid audiences, the occasionally fake cases ( some people just want to be on TV, just look at Maury and Springer ), but the law, well that’s something else entirely. I never understood the whole concept of ‘ make you whole ‘. What that is, is making sure someone is compensated for whatever funds they are out. Basically that means that someone can take advantage of someone and not in any have a consequence for that action. There is no ‘ consequence ‘ in making someone whole. For instance, I withheld your damage deposit simply because I could, and worse case scenario you would take me to court and I’d have to pay you. Best case scenario, you don’t take me court and bi-ching bi-ching let the cash register ring I get a winfall. There’s no loss, no consequence, to someone doing that. Any time you have been slighted there should be a consequence. And granted in some States, and in some scenarios, there are. But it should apply to every occasion. Or the law is just encouraging people to screw you over. If, for instance, you were in an accident, and you had to pay a $500 deductible on your car insurance, and incurred no medical costs ( hence no pain and suffering, or medical bills ), because someone didn’t tie their dog up and you swerved to avoid hitting it, should the dog owner get away with just paying the deductible, hell no, there should be a penalty for fault. After all, you now have a damaged vehicle ( albeit fixed ) , had to pursue the case, and likely had to take time off work. Making someone whole is not really making them whole, its only compensating them for loss, while the one at fault is not penalized at all. They only pay to make the person whole, and they are not whole. Added by admin on June 2, 2017.